Today, most people think of eighties motocross as an era of big hair, short shorts and neon colors. Today, most people think of eighties motocross as an era of big hair, short shorts and neon colors. While that is certainly true of the later part of the decade, the early years of the Reagan decade were anything but. 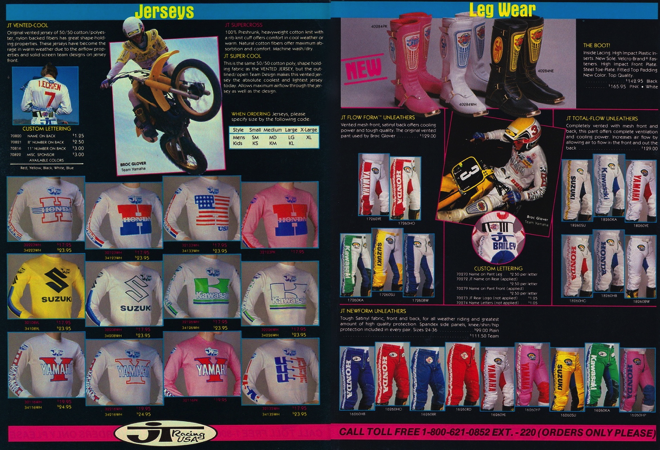 Early eighties motocross apparel consisted mostly of primary colors and simple designs. If you were really cool, you might have some boot gators and a Yamaha or Honda logo on the side of your pants, but for the most part, gear was simple and understated. 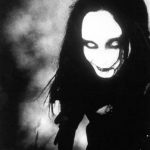 By the middle part of the decade, things had started to change. Within a few years, monochromatic was out, and kaleidoscopic was in. Crazy colors became all the rage, with red, white and yellow giving way to pink, orange and purple. By the end of the decade, things had escalated to the point where zebra stripes, polka dots and spider webs had become the new normal. While this transition was a gradual one, the first shot in this motocross Cultural Revolution can be pinpointed to one day: November 3, 1984. 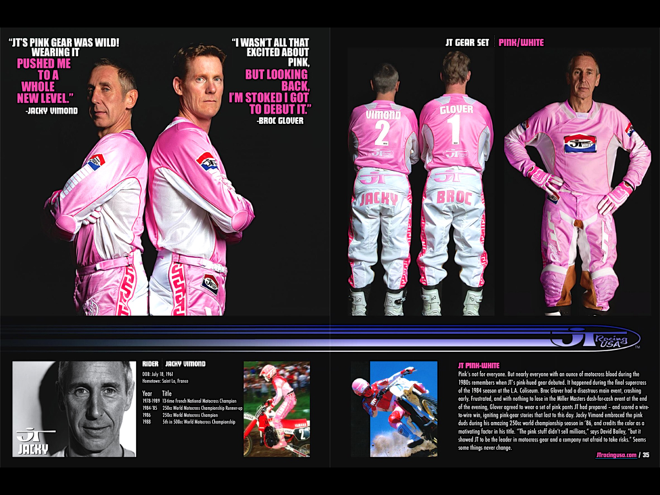 This is the day that John and Rita Gregory introduced the motocross world to pink as a primary color. Set against the backdrop of the most historical venue in Supercross, and in front of a crowd of over 60,000 fans; the Gregorys and Yamaha’s Broc Glover changed the look of motocross forever. Along with being a cultural turning point, November 3, 1984 also happened to be the last round of the 1984 Supercross season. Held in Los Angeles’ iconic Memorial Coliseum, the Superbowl of Motocross had been moved from its traditional summer date to November, due to Los Angeles’ hosting of the 1984 Summer Olympic games. While this meant the newly-renovated Coliseum looked better than ever, it also meant the ’84 season would take nearly eleven months to crown a champion. 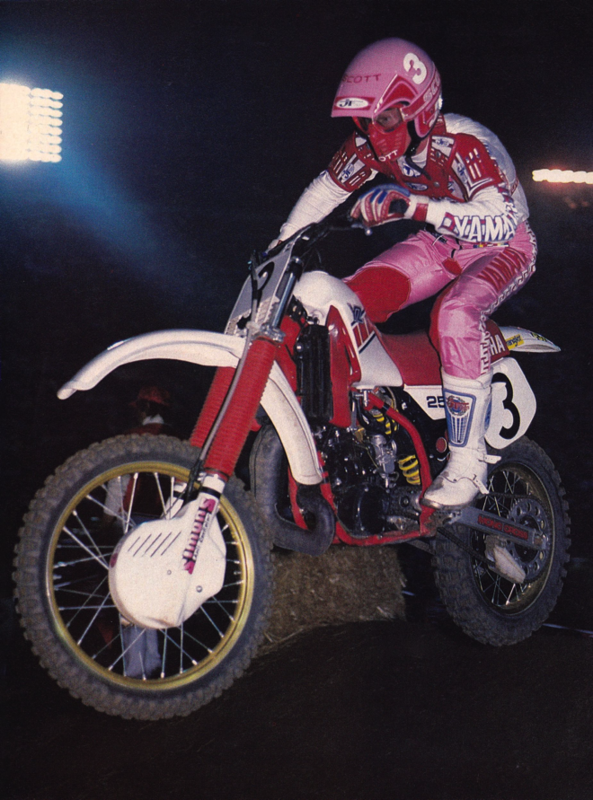 Kicked off in late January, the 1984 Insport/Wrangler (the AMA only promoted two of the seventeen events in ‘84, due to a promotional dispute that would be played out again nearly two decades later) Supercross series would include six different main event winners and crown a first-time champion in the form of Honda’s Johnny O’Mara. In addition to offering an exciting series, the ’84 season also enjoyed the honor of including the highest-paid single event of its era, the Miller Masters Challenge. 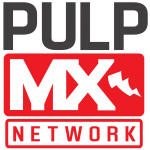 Designed to be a season-ending showdown that pitted all the best riders in a ten-lap sprint, the Miller Masters Challenge offered a then-unheard-of $50,000 purse, with a full $30,000 going to the winner. 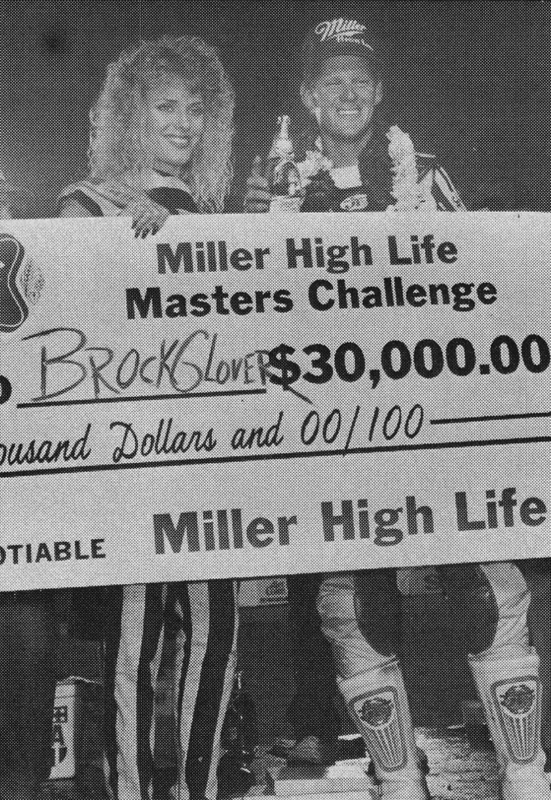 Originally, only main event winners were supposed to be invited, but event sponsor Miller Beer had concerns that there would only be six competitors in the race. 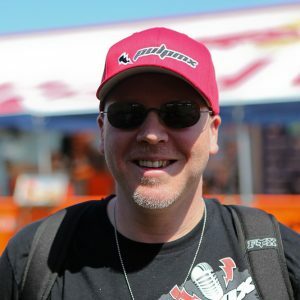 At Miller’s behest, the race was opened up to the top ten in points, with a few wild cards like Canadian Supercross champion Ross Pederson thrown in. Eventually, 15 riders lined up for a chance at the $50,000. One of the riders set to do battle in the Miller Masters Challenge that night was Yamaha’s Broc Glover. A five-time (at that point) AMA Motocross champion, Glover had failed to win a single main event in ’84, but had made it in based on his points standing. The ’84 season had not been one of Glovers best, being handicapped all season on a (very) lightly modified production Yamaha. At this time, full-on works bikes were still legal in America, but because of budgetary reasons, Yamaha had chosen to race production-based machines in ‘84. This meant Glover and his Yamaha teammates were forced to compete on bikes that literally cost a tenth of what their competition was racing. While Glover was limited somewhat by his production-based equipment, he suffered no such deficiencies in the gear department. At the time, JT Racing was the absolute pinnacle of motocross style, and as one of the brand’s marquee riders, Broc had first crack at all the latest and coolest designs. At Los Angeles, this meant an opportunity to race in John and Rita Gregory’s latest innovation – powder pink. 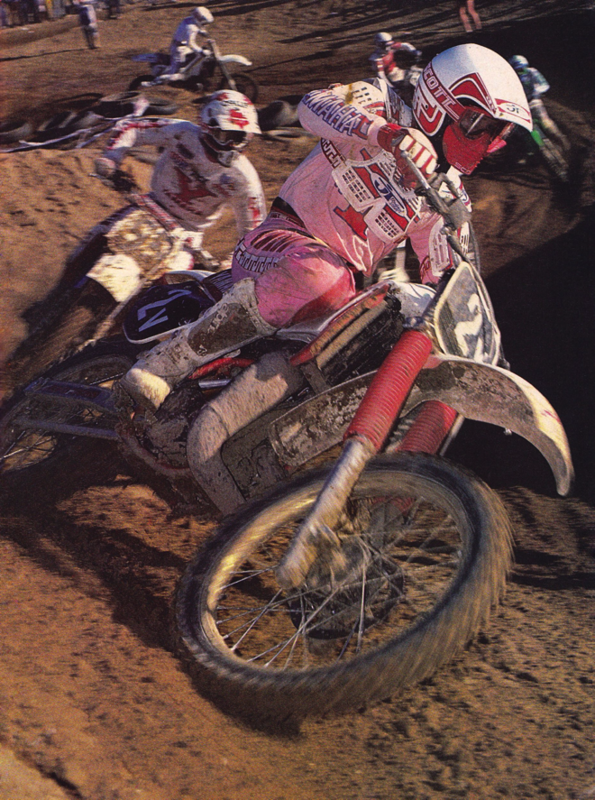 Originally, Gregory’s desire was to debut the pink gear in the Superbowl of Motocross main event, but when the time came to suit up, Glover got cold feet. Fearing he would look stupid, he stuck the pink back in his gear bag and instead chose to race in his traditional red and white. While not particularly exciting, this would match nicely with the new Yamaha colors on the ’85 YZ250 he would be racing. At the start of the main event, Glover jumped out to a great start, right behind Honda’s Ron Lechien and in front of Kawasaki’s Goat Breker. For the first lap, Glover stalked Lechien, looking for a window to pass. As they made their way down the peristyles, Glover made his move and got alongside the Honda ace. At the bottom of the peristyles, Lechien tried to retaliate, but instead washed out his front end and took them both out. As the two struggled to get their bikes untangled and going, the rest of the pack blasted by. Once up and running, Glover put on a heroic charge, but only managed to make his way back up to fifth at the finish. After his misfortune in the main event, Glover was understandably upset as he rode back to the pits. He genuinely believed he had the speed to win that night and the crash with Lechien had robbed him of that opportunity. After the disaster in the main, Glover felt he had nothing left to lose and asked John to grab those crazy leathers after all. John lobbied Broc to wear the entire pink ensemble (helmet, jersey, pants and boots), but the Golden Boy was not quite that pissed off, so he settled on just the helmet and pants. When Glover re-entered the stadium, a low murmur began in the Coliseum crowd. After a few seconds, this puzzled murmur transformed into an audible cheer as Glover circled the perimeter of the stadium on his way to the staging area. The pink gear may have been a gamble, but it was clear the LA crowd admired his bravery and bravado in wearing it. Determined to make up for his disappointing main event, Glover nailed the start of the ten-lap Miller Masters Challenge, edging out Johnny O’Mara (who had been named the new Supercross Champion earlier in the evening), Lechien and Jeff Ward to take the holeshot. After grabbing the lead, Glover was never challenged, opening up a huge advantage and leading every lap on his way to a $30,000 payday. Interestingly, Broc’s pink gear would only last one year in JT’s lineup. Jacky Vimond would make it famous in Europe on his way to the 250 World Motocross title, but it would never catch on as strongly in America. By 1986, it would be replaced by florescent shades of red, orange and blue as the hot colors in JT’s stable. While powder pink may not have been a runaway success on its own, it is impossible to underestimate how influential its appearance on the scene was to the industry as a whole. Once Broc Glover rode out onto the Coliseum floor in his pink leathers and waxed the field, the creative juices of a new generation of designers were ignited. On November 3rd, 1984, Glover and the Gregorys did more than win a race; they kicked off a style revolution.